“Lascar” gown from the 2000 haute couture collection. Although it only comprises eight of the looks at the exhibit The Fashion World of Jean Paul Gaultier: From the Sidewalk to the Catwalk, now on view at Brooklyn Museum, the sailor ensembles had, for me, one of the biggest impacts of the show and the most personal relevance. 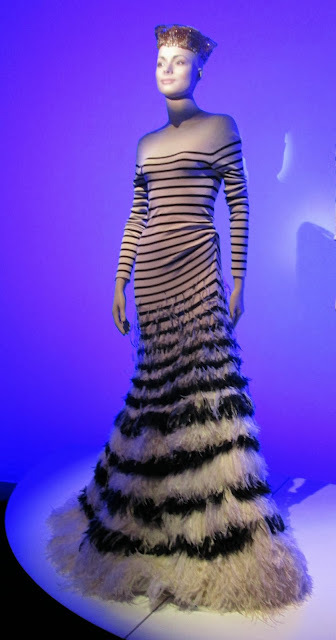 I’ve always loved Gaultier’s take on stripes and this was no exception. Since was my father was in the Navy I feel especially close to these clothes. Peacoats and stripes are in my DNA! The sailor collection at the Brooklyn Museum. What I particularly love here is how Gaultier takes a simple concept and explores it, making it more extraordinary and fun. There is nothing more classic than a naval uniform no matter what country you sail for, but I love that Gaultier pays homage to the elements of international sailor style by pushing it toward its limit or by turning it on its head. Princess Caroline of Monaco wore this gown in 2000. I love the addition of the ostrich feathers! “Bateau-lavoir” ensemble from 2002. Check out the back below! This took 152 hours to make. The blur on the left is Mr. Gaultier himself! A Palm Leaf Jacket-Hat from the 2003 “Buttons” collection. The pants are from 1983. I love the pairing of these two pieces. Love this dress though I caught the mannequin in a scary facial moment! This dress is from 1997. I love the alternating patterns of lace. The Fashion World of Jean Paul Gaultier: From the Sidewalk to the Catwalk is on view at the Brooklyn Museum until February 23, 2014. I don't think it would work for me anymore lol but love that sailor outfit! Ha, Denton, you are SO funny! I would skip the shredded leather sailor ensemble too but sign me up for the first dress with the stripes and the ostrich feathers. Yes, please! Thanks for sharing these great pieces from the exhibition. I've always loved Gaultier's take on stripes! Thanks again, Jill for a lovely tour of an exhibition I'd never even hear of, much less get to see! Breton stripes, nautical stripes, etc. are a big favorite at our house. Dan, my huz, was quite taken with Jean Seberg in *Breathless* at some point in his early youth. It's one of those iconic looks that always brings up some romantic associations of some kind ... you smell the sea, and hear the waves crash as the hull of the ship hits the water. Dan smells a warm baguette, the cork just pulled from the bottle of red wine and hears Edith Piaf in the background. And the young Jean, of course!